Pablo Picasso, best known as “that guy who drew people with bizarro faces,” has been attributed with a famous quote. “Good artists copy, great artists steal.” Over the years this phrase has been used by a host of people who, well, stole something and wanted to justify it. Evidently stealing is fine if a dead Spanish cubist endorses it. He also had a secret affair with a 17 year old, so maybe he isn’t the best role model, but that’s beside the point. As far as I am concerned, the phrase has been misinterpreted by most of the people who have used it. Let’s take a look at what I think it means, and then you can decide for yourself. For one thing, I’m fairly sure Mr. Picasso wasn’t saying the only prerequisite to great artistry is sticky fingers. If that was true then the fingerprints of cat burglars would be worth a fortune. And yet, this is the most popular interpretation. If you are caught stealing, you cite the Picasso defense. Steal an OS idea, steal a T-Shirt idea, steal a song? Quote Picasso. Abstract artists absolve all sins, and copyright disputes, too. I’m glad Picasso didn’t have anything to say about murder or we’d be in a bloodbath right now. It is only a matter of time before people start taking the quote literally. Then you’ll have a starving artist running off with a plasma screen in hopes of becoming the next Andy Warhol. And if you interpret it as great artists literally stealing great works, then the entire modern art community would be like one massive game of capture the flag… which would actually be kind of awesome. 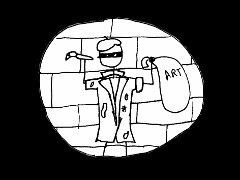 Let’s assume by the general lack of daring heists by fine arts students that when Picasso spoke of stealing, he didn’t mean physically stealing the original work of art. But if he just mean stealing the idea, then the quote is redundant. Copying someone else’s work and stealing it is the same thing for artists, isn’t it? If so, then why would he say the quote to begin with? Considering the fact that he was one of the few famous artists to survive long enough to enjoy the fruits of his labors, he probably wasn’t an idiot. What does the quote mean then? Well, here’s my theory. You know the movie True Lies? Arnold Schwarzenegger, Jaime Lee Curtis, and a harrier jet? Yeah, that’s a remake. The original was a French film called “La Totale!” which I’ll bet you’ve never seen. That’s because James Cameron stole it. (It is also because the film was in French and this rant is in English, but that doesn’t really help my case, so we’ll skip it.) Sure, he had permission, but that doesn’t change the fact that he took the concept dreamed up by Claude Zidi and forever made it his. I think that’s what Picasso was getting at. A good artist will use an idea someone else had. A great artist will do it better than the first guy ever could. Take the moonwalk for instance. It was created by Michael Jackson, right? Nope. Cab Calloway was doing it in 1932, and many others after him. It is hard to say who created it and who copied it, be we all know the guy who stole it. I’m not saying that I’m right. For all I know Picasso was giving aspiring artists carte blanch to plagiarize themselves to fame and fortune. But if I am right, it means that even being able to steal something is a true sign of artistic skill. I mean, think about it. If you can take an idea, an image, or a song, and do it so well that you make it totally and irrevocably yours, then I think you ought to be allowed to keep it. I’ll probably continue to feel that way right up until someone steals one of my ideas. Once that happens I expect to have a sudden change of heart, at which point I guess I’ll need to find a better quote. And a few lawyers.